Up for sale is an easy-to-run dropship eCommerce store that sells USA-sourced massage tables and spa tables. Over the past 6 months (February - July 2018), the store has averaged $7,117 of revenue and $671 of net profit per month. The site ranks on Page 1 of Google for 57 search phrases, which are collectively searched for about 4,760 times per month in Google, driving a decent (and increasing) amount of free organic traffic to the store each month. See the Rankings and Traffic section below for more details. Over the past 6 months (February - July 2018), the store processed 98 orders with an Average Order Value (AOV) of $436. With a gross margin of 18.5% (after COGS, shipping and merchant fees), this means the average order generates ~$81 of net profit. Not only does this mean you have a large profit margin to work with in PPC advertising, but it also means you don't have to process very many orders each month to generate a healthy profit. On average, the owner only has to process ~16 orders per month. He currently spends about 8-10 hours per week operating the store. The owner, who is a long-time member of Store Coach, is selling the store for a couple reasons... First, he's in the process of launching a new (unrelated) product under another business and needs capital to place a bulk order. He also owns another dropship store (in an unrelated niche) that has been gaining steam the last few months, and he'd like to devote more of his time and attention to that business. Following is the P&L Statement for the most recent 6-month period (February - July 2018). Click the P&L image to open a full-size version in a new tab. The product catalog currently contains approximately 380 products from 7 of the top brands available from USA manufacturers/wholesalers. The seller will assist the buyer with either taking over his existing reseller accounts with each of the suppliers or with providing personal introductions to assist the buyer with setting up new reseller accounts (if the supplier doesn't allow the buyer to just take over the existing reseller account). After you sign the NDA below, we'll be happy to provide the SEMrush.com rankings report for the site, from which the above data was derived. 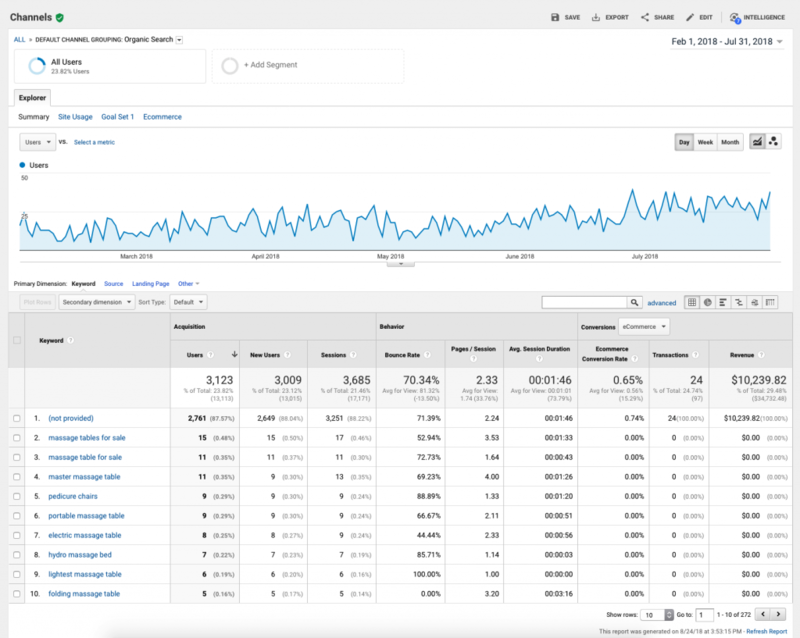 Here's a screenshot from Google Analytics that shows the store's increasing organic traffic trend over the past six months (February - July 2018). Processing Orders - When a new order comes in, he forwards the order information on to the appropriate supplier. Then, once the supplier notifies her that the order has shipped, he updates the order status in the store admin panel and forwards the tracking information to the customer. Writing New Articles - The current owner has historically written one new article per month, which has helped the store achieve the organic rankings it has (which are clearly improving over time). Managing the Product Catalog - This includes adding new products, updating pricing (occasionally), etc. 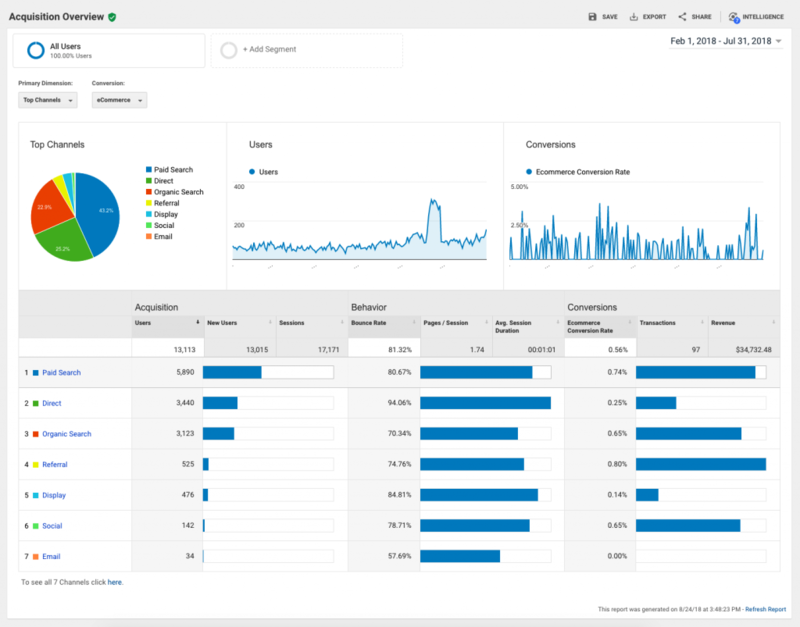 Analyze and Tweak PPC Ad Campaigns - Every couple of weeks, it's a good idea to spend a few minutes analyzing the PPC campaigns' performance and modifying them as needed. As part of the sale, the current owner will train the buyer on all aspects of running the business. This will include up to 15 hours of "live" training (via web meeting, webinar, Skype, phone, etc.) as well as 30 days of email support. Add Top 2 Brands of Massage/Spa Tables - When the current owner built this site about 15 months ago, he was unable to establish reseller (dealer) accounts with the top 2 brands of massage/spa tables due to the site being brand new. Both of these manufacturers told him to check back with them "after one year," which it has now been. He's been planning on reaching out to them again (now that the site has established pretty good rankings, is getting a fair amount of traffic, and has a 15-month history of sales and profits) but hasn't done so yet. The buyer should be able to immediately reach out to these top 2 manufacturers and set up reseller (dealer) accounts with them and then add all of their products to the site. Adding these best-selling brands and products to the site should provide an immediate boost to sales and profits. 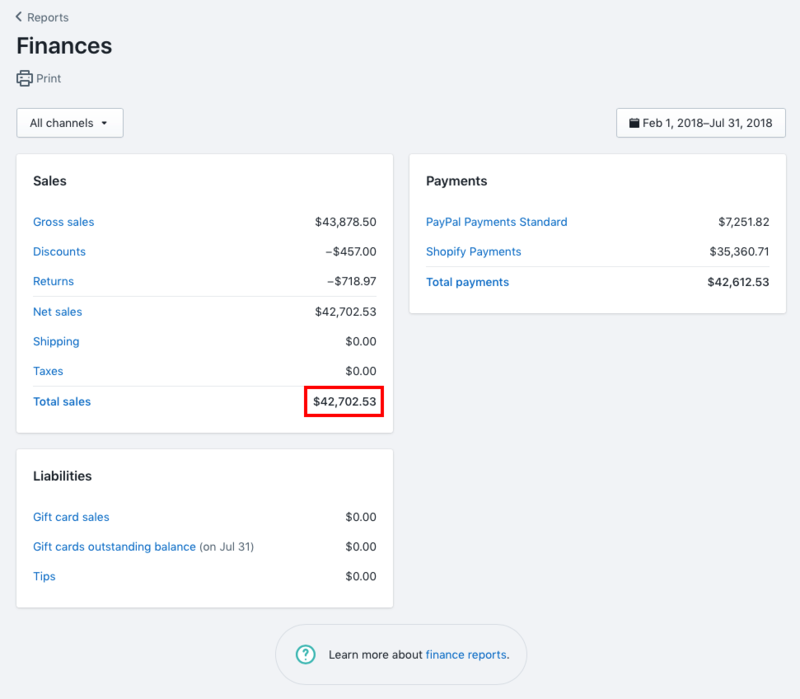 Expand PPC Advertising (and Use Product-Specific Bidding) - The current owner is currently only spending ~$523 per month (on average) on paid advertising campaigns. The vast majority of that monthly spend is on Google Shopping ads (aka Product Listing Ads, or PLAs), with very limited spend on Google search ads and Bing ads. In addition to optimizing the current paid advertising campaigns (by using product-specific PPC bidding, audience-based bid adjustments, etc. ), the buyer could no doubt increase sales and profits by increasing the ad budgets on existing campaigns as well as adding several new campaigns, including: 1) Google remarketing ads, 2) Bing remarketing ads, 3) Facebook remarketing ads, 4) Facebook/Instagram ads, 5) Pinterest ads, and several others. The current owner is currently barely scratching the surface with regard to PPC advertising opportunities. Perform SEO on "On-the-Verge" Keyword Phrases - As noted in the Rankings and Traffic section above, the site has 57 "top 10" rankings in Google. These Page 1 rankings account for the majority of the free, organic traffic the site gets. 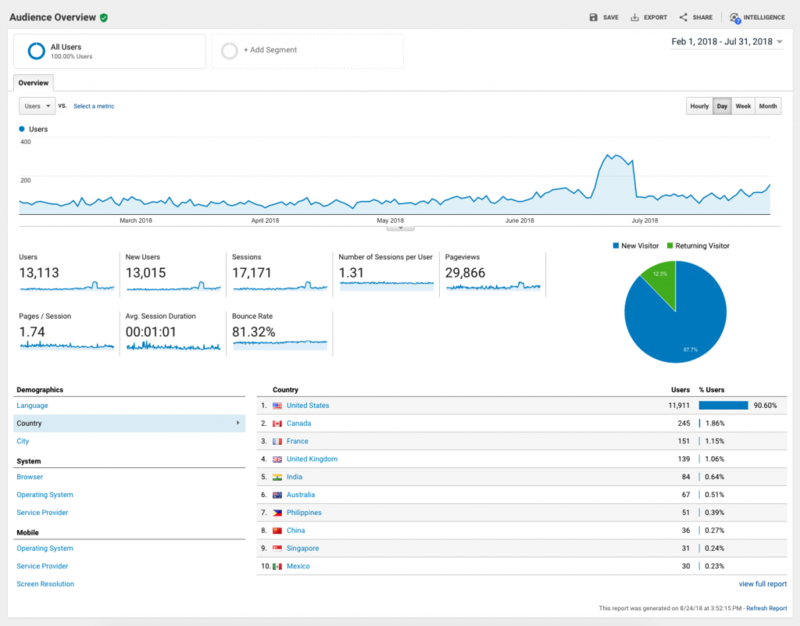 Just imagine how much more organic traffic the site would get if the 132 keyword phrases for which the site currently ranks 11th - 20th (which are searched for 9,040 times per month) were moved up to be top 10 rankings. Or imagine if the 160 keyword phrases for which the site currently ranks 21st - 30th (which are searched for 47,700 times per month) moved up to be Page 1 rankings. A little SEO effort could go a long, long way as marginal rankings improvements could sky-rocket traffic! Have a Profitable Online Business You're Thinking of Selling? Net more and pay less with Store Store Coach's professional website brokering service. Our listings are better, our fees are lower, and all Store Coach Marketplace listings are now published on Flippa.com and BizBuySell.com as well (for no additional cost)! Click here to get more information and to request a zero-obligation free business valuation. Disclaimer: Store Coach, Inc. is acting as the broker of the sale of this website/business. The website/business owner is solely responsible for all figures, statements, claims and information provided on this page as well as all figures, statements, claims and information which may be provided to interested parties during the due diligence process. It is the responsibility of the eventual buyer to review and verify all figures, statements, claims and information provided by the website/business owner. We'll net more & you'll pay less when you list your site with us! Don't Want to Run This Site Yourself? Ask us about the option to purchase this site as part of a buyer's group. Share in the profits but not in the work!